So, my birthday’s coming up this month and with it, the onslaught of “gifts” from my favorite retailers. Nowadays, almost every chain, salon, restaurant, etc. has a birthday perk as part of its loyalty program. Even my dog gets birthday bonuses! If you’ve signed up for any of these programs, you know what I’m talking about. 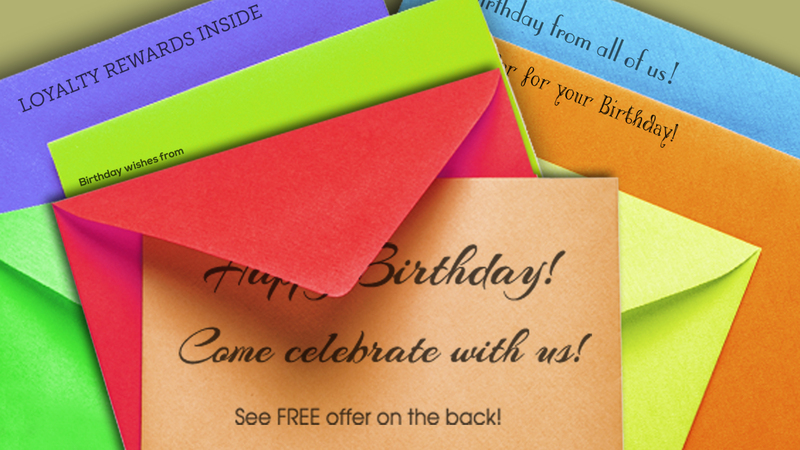 All the cards and coupons they mail and email to wish you the happiest of birthdays and to thank you for your patronage – all the while knowing it’s themselves who will be rewarded. Now I realize that every day could be considered a birthday by the barrage of emails we get promoting a sale or offer, but for some reason, it’s those birthday come-ons that get me the most. I’ve already been showered with “gifts” of: $25 off a purchase of $100, $15 off any service valued at $85 or more, 15% off my purchase, a free coffee or dessert, extra points in my birthday month, and my favorite – “free” money. And I’m not even scratching the surface. There are websites providing lists and links to hundreds more birthday perks a person can sign up for. I could spend as much time as those extreme couponers do redeeming my gifts! Anyway, I digress. As a human being, I can’t help myself. The right side of my brain is working overtime! I get really excited putting all of these collected “gifts” into my purse. My adrenaline is surging. My heart is pumping. My plan is set. I allocate an afternoon to using these gifts to treat myself – it’s my birthday after all, so I deserve it! Plus, I need to use these bad boys before the month is over! As a marketer, I should (and do) know better. My left brain recognizes that with these programs nothing is really free. I’m trading my personal information, signing up for still more emails, spending cold, hard cash – all for a measly gift (which in many cases isn’t even a gift!). How do I inspire brand loyalty and, therefore, customer retention? What am I doing to acquire new customers? How am I going to cross- sell, motivate more units per sale and more frequent purchases? How am I encouraging customers to purchase higher margin products or services? Come the end of July, I will have bought things I don’t need, spent more money than I intended. I’m a victim of my own industry – attracted by birthday perks – not to mention great packaging, a compelling offer, incentive or promise. Because, at the end of the day, even we marketers are humans. Congratulations marketers, job well done! See you next July.